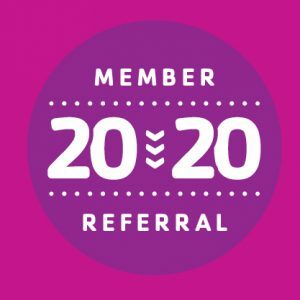 The 20/20 Member Referral is a pilot program. At the end of six months, the YMCA Board of Directors will evaluate its success. When a member refers a friend online, BOTH the member and their friends who join the Y will receive a 20% reduction in the standard rate of membership for as long as both are members! Invite your friends to join the YMCA of the Alleghany Highlands through this simple online referral process. *Eligibility Requirements apply. 20% Savings begin with first full billing cycle. Both memberships must be paid via monthly auto draft. May not combine with other discounts. Complete the form below to refer a friend and take advantage of the 20/20 Member Referral. Please make sure to include your friend’s first and last name in your message!